From Roger Ebert's My Winnipeg review: "If you love movies in the very sinews of your imagination, you should experience the work of Guy Maddin. If you have never heard of him, I am not surprised. Now you have. A new Maddin movie doesn't play in every multiplex, city or state. If you hear of one opening, seize the day. Or search where obscure films can be found. You will be plunged into the mind of a man who thinks in the images of old silent films, disreputable documentaries, movies that never were, from eras beyond comprehension. His imagination frees the lurid possibilities of the banal. He rewrites history; when that fails, he creates it." My partner always refers to this movie as The Forks Beneath the Forks. Or The Forks the Lap the Fur. Since I'm having trouble thinking of what to say: a friend once pointed out that a complementary work is the Weakerthans' "One Great City." True story: I had, I think coincidentally, decided recently that I needed to own this on physical media, so I ordered it and received it a couple of days before I saw the announcement that it was on the calendar here. So I've been sitting on my brand new DVD for a minute now, waiting to rewatch it when the thread came up. Which I did, just now. 1. Possibly the most brilliant thing about this movie is how Maddin manages to tie together such evocative dreamlike imagery and disconnected stories into a cohesive narrative. The interconnected themes, the mood, the imagery all tie together in their own way. The only other filmmaker I can think of who does this as well as him is David Lynch, but they do it very differently. 2. I have had lifelong sleep disorders, and one of the weirdest things about getting old is that I've found myself deeply and achingly nostalgic for the insomnia of my youth, before I had a family and a self-contained house in the suburbs, when I'd just kind of wander around at night. There is a very specific mood I'm always kind of chasing, of being awake in a city that turns seedy and strange at night, and this is among a very short list of films that recreate some of that for me. There is something so soothing about the municipal sleepwalker legislation and the street vs. alley navigation. And orange Jello is night manna, always and forever. 3. Maddin is a very flawed human, if only because he admits his flaws so readily, demonizing his mother and fulminating on hockey stuff (see Cowards Bend the Knee for further exposition on both). But he's articulate and he's self aware and he's funny and he is a poet. And there is something about all the meta-ness, where he's narrating how he is directing his mother to recreate melodramatic stories from his childhood that makes it somehow more realistic to me than realism ever does. This is what I love about film. Maddin is one of those directors who exemplifies why film is a unique and transcendent art that goes beyond narrative and sound and imagery. You couldn't tell this story in any other single medium. And lastly, I want to mention that Maddin's latest full-length movie, The Forbidden Room, is just now wending its way across the US, and it looks amazing from the trailer, so if you are at all interested, keep an eye out for it. I'm in a mediumly biggish market, and I only just found ONE showing on a college campus nearby this Friday, so if you're interested, you're on your own finding a screening. Great little movie! I think this might be the year that I actually try tackling Guy Maddin's filmography. I've had it in the back of my head to see this film as well as Gimli Hospital and Dracula: Pages From A Virgin's Diary for a few years now, but never quite got around to them because they never turned up on Netflix or wherever. 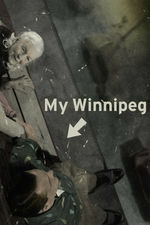 Maddin's attempt at mythologizing Winnipeg and his own childhood reminded me a lot of my own Midwestern U.S. upbringing, as well as the ways in which you can live through hometown experiences that are either near-universal or entirely particular to you, but you might have trouble telling which are which until you start comparing notes with classmates and coworkers later in life. Everybody's hometown is a collection of quirks, some endearing and some terrifying, and everybody has a unique story to tell about living inside or around them. This movie is incredible, and a major influence on me as a filmmaker. The documentary I'm working on now would have turned out very differently had I not seen My Winnipeg. In my mind I tend to connect this film very closely with Chris Marker's Sans Soleil. I wonder how they'd be as a double feature. The Harvard Film Archive is currently showing a bunch of Madden's films, and even having him attend a few screenings in person! I'm seeing Cowards Bend the Knee tomorrow. Supposedly it works as a sort of companion piece to My Winnipeg. I'm really excited! I like to believe that everything in this movie is true. That just reminded me, I once stumbled on some documentary club or service or something that featured My Winnipeg, and there were a bunch of HEY WAIT A MINUTE and WTFs. Some people seemed angry, some were charmed. It was pretty great. I think of it, though, as a sort of personal documentary. It's just that most of the memories are subconscious, from dreams and fuzzy childhood memories, from when he was a really little kid and didn't yet have the plausibility filters that you acquire as you figure out how the world actually works. It's not that our memories are actually more reliable or accurate as adults. It's just that we have a better grasp on reality and tend to filter them through that, so when we fill in blanks, we have a better idea of what could have plausibly happened, whereas kids really don't have that understanding yet, and are more likely to include bizarre and fantastical elements. The dynamic between his mom and sister and hitting the deer, or the scene where they torture mom with the bird to get her to cook for them were two major ones really come across as how a kid might remember some interaction they didn't fully grasp at the time, maybe conflating events, leaving things out he didn't understand and filling them in with something that seemed logical at the time. The frozen horses is definitely something a drunk uncle would say sarcastically that I...I mean someone would then enthusiastically repeat verbatim to all the other kids in the school. Swear to God, my uncle said it and as all 8 year olds know, adults are infallible. Here's the announcement for that Strange Club surprise I was hinting at - for Halloween weekend, we'll be teaming up with the Criterion On Hulu Club to watch House (aka Hausu)! It's one of my favorite horror movies ever, a pure delight. Really looking forward to it.